With Venezuela having lost their opening two World Cup Qualifying fixtures, Hispanospherical.com looks at the situation facing manager Noel Sanvicente, his team’s preparations for their visit to high-altitude La Paz to face Bolivia as well as the notable call-ups for this game and the subsequent home encounter with Ecuador. ‘I am not a coward, I won’t resign’. So proclaimed Venezuela boss Noel Sanvicente last month at a lengthy press conference shortly after his nation’s Russia 2018 qualifying campaign had been inaugurated with two straight defeats. The 3-1 loss away to Brazil may have been largely anticipated, but the embarrassing late defensive mix-up that caused a 1-0 reversal in the opener in Puerto Ordaz at home to Paraguay certainly irked fans, greatly lowering morale at the first hurdle. Coming off the back of poor friendly performances and the failure to reach the knock-out stages of Copa América 2015, many fans ran out of patience with Chita. The ex-Caracas and Zamora director técnico has lost considerable goodwill in his 16 months in charge. Results have not met expectations, displays have been lacklustre and most players have struggled to replicate their club form. Regarding this last point, given the tactical incoherence repeatedly exhibited as well as the high number of attackers fielded with similarly incohesive results, many point the finger of blame at Sanvicente as his intentions continue to puzzle and bewilder. In further comments to the media, while he acknowledged some of the criticism and accepted responsibility, he seemed unwilling to consider a fundamental shift in his approach. Instead, amongst other things, he lamented the ‘accident’ involving Oswaldo Vizcarrondo and Alain Baroja that gifted the win to La Albirroja and also remarked upon the superior club levels that many of his country’s opponents play at – an observation that ‘you don’t have to be Harry Potter to see’. Before Sanvicente categorically stated that the thought of ‘resigning doesn’t go through my head’, he also reiterated that ‘my thing is work, work and more work’. Weary words for many Vinotinto fans as ‘all work and no play’ would certainly be a succinctly apt assessment of his goal-shy reign to date. Under pressure, currently point-less and in charge of the lowest ranked nation in CONMEBOL (83rd), Sanvicente knows that all this much-vaunted labour must be converted into positive results as soon as possible. This month’s challenges from fellow strugglers Bolivia as well as injury-hit high-flyers Ecuador, while certainly substantial and seemingly with the potential to send Chita scurrying out of a job, do also offer opportunities to reinvigorate the cause. However, though he has claimed his methods will not be changing any time soon, the personnel definitely will be – more so than at any other point since he took up the post. Indeed, Thursday’s trip to La Paz’s Estadio Hernando Siles – over 3,600 metres (nearly 12,000 feet) above sea-level – serves up all kinds of logistical issues that South American nations have attempted to counteract in differing ways. Sanvicente has opted to call up an enlarged squad of 33 players, with 20 of them making the journey to Bolivia; these comprise of an equal mixture of ten home-based individuals and ten, largely more established, legionarios who ply their trade abroad. Several of the latter possess experience of playing at high altitude at club and/or international level but it is those currently featuring in the transitory Torneo Adecuación who have undergone the greatest preparation ahead of this game. For the past three weeks or so, they have been training at La Vinotinto‘s National Centre of High Performance (CNAR) facility on the northerly Isla de Margarita. Ideally, physical trainer Rodolfo Paladini said he would have liked 17 consecutive days with the players but due to club commitments for some – though not all – this was somewhat problematic. Nevertheless, when available, this domestic crop have been spending time in hyperbaric chambers which are intended to help users experience and acclimatise to simulated high-altitude conditions. In the few days preceding the game, the overseas-based contingent have gradually been joining up with them at CNAR and today, Wednesday 11th, the 20-strong group flew to Bolivia. However, rather than travel straight to La Paz, they are instead staying in the relatively low-altitude Santa Cruz de la Sierra (416 metres above sea-level). Tomorrow on matchday, they will embark on a get-in-and-get-out strategy as they shall enter the city of the fixture no more than two hours before kick-off; some Bolivia-based portable chambers have been hired to assist any breathing problems they may experience. Almost as soon as the game is concluded, the squad will then take an aeroplane back to the national training centre. A calculated risk, no doubt, though far from the first time something like this has been deployed by a South American nation. The altitude issue has been a bone of contention for decades and FIFA resolutions have been passed more than once (notably in 1995 and 2007) to ban international games in La Paz, though these were subsequently repealed. It is undeniable that even if not all of Bolivia’s players are accustomed to high-altitude conditions, they have more than enough who are and this has been a partial factor in many victories over some of the continent’s heavyweights. Anyone resistant to this argument may wish to briefly peruse the nation’s woeful record away from home – their Copa América win against Ecuador in June was their first competitive victory on foreign soil since 1995. Nevertheless, though their home advantage has attained near-mythical status over the years and casual observers may consider a visit from CONMEBOL’s lowest-ranking team as a banker win for La Verde, this is far from assured. Indeed, in the past two visits during World Cup Qualifying campaigns Venezuela have attained a 1-1 draw (in 2013, when Juan Arango’s last international goal was cancelled out with four minutes left) and a 1-0 win (in 2009 via an own goal; this was during the same qualification cycle in which Bolivia beat Argentina 6-1 and Brazil 2-1). If, however, they are unable to get a result, the pressure will be on to get one against Ecuador – no mean feat as La Tricolor are riding high following two consecutive wins, the first of which being a sensational 2-0 away triumph against under-fire Tata Martino’s Argentina. Though they will be missing key-man Antonio Valencia, they have strength in depth and will fancy their chances as last month’s heroics came without Enner Valencia, Michael Arroyo or Renato Ibarra on the pitch (and who are all injured this time around). The likes of Jefferson Montero and Felipe Caicedo promise to offer the Venezuelan backline a consistent threat throughout the game. Again though, La Vinotinto have a strong recent qualifying record in this particular fixture, drawing the last encounter 1-1 and winning the preceding two 3-1. Post-La Paz, after the full Venezuela squad reconvenes at CNAR, they will head over to Puerto Ordaz for this game looking to give the Estadio Cachamay public something to cheer about. Indeed, not only did the 1-0 debacle against Paraguay occur at this ground but in September it was also the site of two dreadful displays: a 3-0 reversal meted out by Honduras which was followed by a 1-1 draw with Panama on a bog of a pitch. An on-field apology of sorts is very much in order. Predicting who will line-up for this second fixture is only marginally more problematic than that of the Bolivia game. Nevertheless, what follows is a brief overview of some players to look out for in the upcoming week, starting with the La Paz trip. ‘The following are the matches of our lives. We have to go out with impetus. [We] can not give away more points.’ Experienced Franklin Lucena understands the significance of these two games and will more than likely start in La Paz, either as a central defender or a holding midfielder. This is owing to his club outings this season at Colombia’s Once Caldas who play home matches at over 2,000 metres above sea-level and who are accustomed to similar levels of altitude in certain away matches. For similar reasons, Luis Manuel Seijas of Colombia’s Independiente Santa Fe has also been touted for a place in the line-up. If both men start, then Lucena will be more than likely at the back with Seijas partnering captain Tomás Rincón in defensive midfield – that is, if El General of Genoa has recovered from his injury. 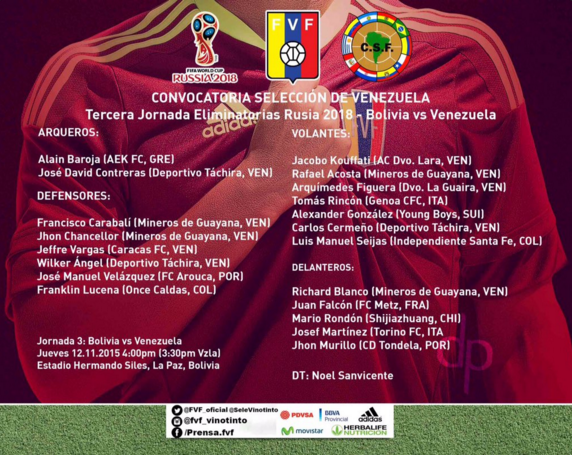 First-team spots have also been rumoured for the versatile right-back/wide-man Alexander González (Young Boys) and centre-back Wilker Ángel (Deportivo Táchira), who both scored the last time Venezuela played in La Paz in a 3-2 defeat in November 2014. So long as he has shaken off his minor injury then first-choice goalkeeper Alain Baroja (AEK Athens) will be between the sticks. Once again, the attacking positions are the hardest to predict though, if utilised effectively, there is certainly talent in the 20-man squad: Josef Martínez (Torino), Jhon Murillo (Tondela, on loan from Benfica), Juan Falcón (Metz) and Mario Rondón (Shijiazhuang Ever Bright) may all be granted a chance to wangle their respective ways into the long-term thinking of Chita. Regarding potential starters from the home-based crop, aside from Ángel, few strong rumours exist though Sanvicente has said he is keen on giving youth a chance. 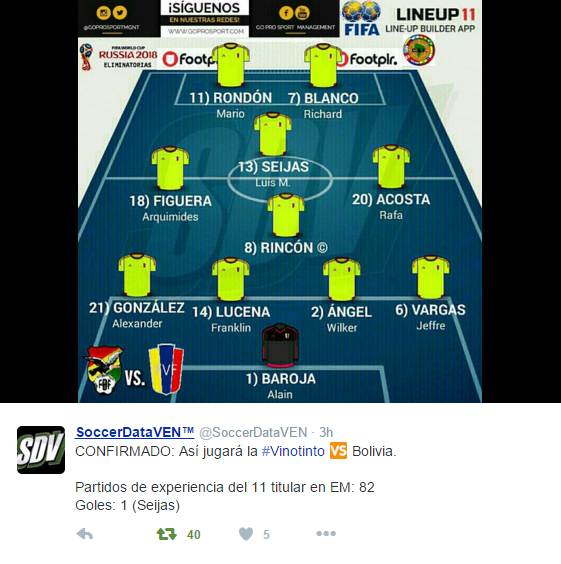 If he follows through on this, many fans will be keen to see international debuts granted to 20-year-olds Carlos Cermeño, a highly rated defence-minded player at Táchira, and Caracas’ attacking full-back, Jefre Vargas. However, one youngster who will not be featuring is the league’s top-scorer, 21-year-old Manuel Arteaga who, despite intiially being called up to the full squad, was the victim of some kind of communication failure between his club and country and so was unable to make the trip. On a more experienced note, midfielder Arquímedes Figuera (Deportivo La Guaira) can not be too far away from a starting berth, having featured as a substitute against Brazil. Who from this group will be in a state to play against Ecuador is anyone’s guess though it can be said with the closest thing to certainty that the following cracks will start in Puerto Ordaz: right-back Roberto Rosales (Málaga), centre-back Oswaldo Vizcarrondo (Nantes) and striker Salomón Rondón (West Bromwich Albion). The locals as well as most fans will also be keen to see Christian Santos and Jeffrén Suárez, two men born in the state but who were raised in other countries and who have only in the past year acquired the relevant citizenship documentation to represent La Vinotinto. The former in particular has been in eye-catching form, banging in 9 goals in 12 games for NEC Nijmegen in his debut season in the Dutch Eredivisie. The latter has also shown promising form as he seeks to revitalise his career with KAS Eupen, who currently reside at the top of the Belgian second tier. One other individual who, due to injury troubles, is featuring in his first international squad since he ran the show away to Honduras in February is 23-year-old Rómulo Otero (Huachipato). For some, a possible successor to Juan Arango, this Chile-based playmaker has long been tipped for a long-term spell in the first team. Alas, this is all largely educated conjecture at this stage. On matchdays, Sanvicente’s line-ups tend to be revealed in advance to the press, so those interested in being in the know at least a couple of hours before kick-off should either return to this page for a short update or follow @DarrenSpherical on Twitter. Otherwise, enjoy the games and feel free to return for some thoughts on them in the upcoming week. Goalkeepers: Alain Baroja (AEK Athens), José Contreras (Deportivo Táchira) and Wuilker Faríñez (Caracas FC). Defenders: Wilker Ángel (Deportivo Táchira), Francisco Carabalí (Mineros de Guayana), Carlos Cermeño (Deportivo Táchira), Jhon Chancellor (Mineros de Guayana), Gabriel Cichero (Sion), Alexander González (Young Boys), Roberto Rosales (Málaga), Jefre Vargas (Caracas FC), José Manuel Velásquez (Arouca) and Oswaldo Vizcarrondo (Nantes). Midfielders: Rafael Acosta (Mineros de Guayana), Arquímedes Figuera (Deportivo La Guaira), César González (Deportivo Táchira), Jacobo Kouffati (Deportivo Lara), Franklin Lucena (Once Caldas, on loan from Deportivo La Guaira), Jhon Murillo (Tondela, on loan from Benfica), Rómulo Otero (Huachipato), Tomás Rincón (Genoa), Luis Manuel Seijas (Independiente Santa Fe) and Ronald Vargas (AEK Athens). Notes: Fernando Amorebieta (Middlesbrough, on loan from Fulham) and Juan Pablo Añor (Málaga) were initially called up to the 33-man squad but have since been ruled out due to injury. Also, Manuel Arteaga (Zulia) was also in the initial squad but has been unable to join up with the group following a communication problem between his club and the Venezuelan football association (FVF). This entry was posted in Venezuela National Team and tagged Alain Baroja, Altitude controversy, altitude in La Paz, Bolivia, Bolivian altitude, Christian Santos, CONMEBOL, CONMEBOL Qualifying, Ecuador, Franklin Lucena, Gabriel Cichero, High Altitude, Jeffrén Suárez, Josef Martínez, Juan Arango, La Paz altitude, La Verde, La Vinotinto, Luis Manuel Seijas, Manuel Arteaga, Mario Rondón, Oswaldo Vizcarrondo, Red Wine, Roberto Rosales, Russia 2018, Russia World Cup 2018, Salomón Rondón, The Red Wine, Tomas Rincón, Venezuela, World Cup Qualifiers, World Cup Qualifying, World Cup Qualifying Games on November 12, 2015 by hispanospherical.